Camping out next to the Exhibition Hall entrance has it's good and bad points. My camping spot by the entrance to the hall. Good side: I got lots of attention. Bad side: I got lots of attention. Out of the 50+ people I chatted with about my LeitraTech, over half of them already knew about me either through the 3 forums I shared a link to this blog with, or by word-of-mouth. Several shook my hand in greeting with phrases like "so I heard you swam here", or "did you enjoy the velomobile baptism?" - referring to my sudden detour into the cold and muddy waters of a canal just north of Oldenburg on Day 3 (see the earlier blog post for that story). I laughed and joined in on making fun of myself. Conversations quickly moved to "how was the trip? ", "how far did you cycle? ", "how did your trike hold up to the touring?" and so on, while they looked over the Frankenstein construction methods of my velomobile. Many seemed quite astonished that even after the crash I continued on. And even more showed surprise that I had been able to cover 700 of the planned 1,200 kilometers - only taking the train between Osnabruck and Koblenz to make up for the lost time repairing the trike. At one point I abandoned my ride to look upon the creations and contraptions that the SPEZI had to offer. Along with the Leitra (Denmark) in all it's various colors and configurations (of which my LeitraTech is heavily based on) I also got a first-hand look (and a test drive - thanks Thomas!) of what I'd like to think of as the 'next generation Leitra': the Thunderstorm. Produced by Steintrikes, the Thunderstorm is a MadMax evo full-suspension trike with a lowered and lengthened Leitra fairing on top. Think "MTV's Pimp My Ride" for velomobiles. The ride was comfortable and fast, and felt much less 'top-heavy' than my LeitraTech or a real Leitra. 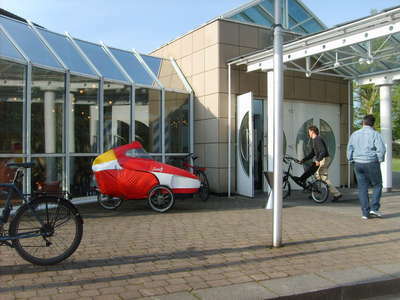 Many other velomobiles were on-hand for display and the occassional test ride, including the Cabbike, the old and new Allewder, the Versatile, the Leiba, the PED-3, and many others. On Sunday afternoon (Day 8), I cycled up to the Germersheim train station with Thorsten and Thomas (regulars at the Leitra shop). From there we rode to Munich, where I purchased a 'Night Train' ticket. I arrived home, in Copenhagen, around 10:30AM on Monday.